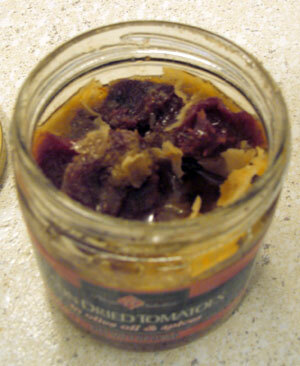 Note to self: sun-dried tomatoes do not go in the fridge. Olive oil at low temperatures resembles hamburger grease. Thankfully, it stopped looking ooky once I thawed it. At least when I put peanut butter in the fridge it was because the label said so. The solid olive oil incident was due to my own ignorance. Between this, the peanut butter that broke my tablespoon and the time I made a fiberglass smoothie, I think I need to start a tag for my entries called “kitchen mishaps.” Hopefully it will not become a frequent feature. Thank goodness I don’t have a gas stove or else I probably would have blown up my kitchen by now. It really can’t hurt to refrigerate stuff like this. Yeah, it looks completely gross, but it can make them last longer. If anything, don’t store anything packed in oil, or flavored oils for that matter, near heat (like near or above the stove). I am very proud that you are not afraid to try different foods. I think that is why dieting can be so hard; we get sick of the same old thing all the time! Even though it looks yucky, I always store my olive oil (or any oil) products in the fridge so it doesn’t go rancid. I just thaw it out each time. But hey, thats me. HAHAHAHA … blame it on the Nyquil. Hope you are feeling better now and can celebrate this weekend! Gas stoves rock, but I have had to buy all new utensils. And a fire extinguisher. I have a jar just like this in the fridge, I just put a few in a small dish and microwave or put a few in a fine strainer and rinse off the oil with hot water. I didn’t learn to cook until I was in my mid 30’s and now I get so many compliments so don’t give up hope of being a gourmet one day! I received my Hallmark gift pack from you yesterday; thanks! It was awesome! I actually put my olive oil in the fridge too — it lasts longer that way. I have to put it into Tupperware tubs first, though, so I can scoop out what I need — it won’t pour out of the bottle congealed! And I often chop garlic and/or rosemary into it first, for extra flavor. Okay, so you weren’t looking for cooking tips, but you show me a picture like that, and what am I supposed to do? Ruh-roh, I did the same thing. And it creeped me out so bad I haven’t eaten anything in oil for months. Been there. Done that. I still tend to refrigerate things like that, but try to make a mental note that it needs to “thaw” before using. I like hearing about other people’s kitchen mishaps; it makes me feel better about my own. The other day I was nearly brained by a grill-pan which probably shouldn’t have been perched on top of the wine rack over the fridge. I never refrigerate my oils or mayonnaise any more. It could be these cold Oregon days and my reluctance to turn the thermostat up past 68 degrees, but nothing has gone rancid. Regular olive oil, extra virgin, mustard, catsup… there are many products that don’t need to be refrigerated. I think the type of processing, use of non-aluminum containers and other safety measures keeps the oils non-rancid. Also, it is good not to refrigerate tomatoes, bananas, potatoes and onions. However, once I prepare a pineapple, I put it in the fridge immediately, following a sad experience. Also, you can refrigerate bread dough at a number of stages to retard the rising – that develops flavor and allows working women to make bread a few hours at a time over a period of two or three days. I know you didn’t ask for a tutorial on uses and misuses of the refrigerator, but I couldn’t help myself! Congratulations on your amazing success. With 187.5 pounds of my own to release you are so motivating. Keep it up and thanks for sharing. No, you were right, you SHOULD keep the sundried tomatoes in the fridge. They do solidify, but they’ll go rancid if you leave them out. FYI! Wow, those look amazingly gross. But I do love me some sundried tomatoes. And I’ve put a jar in the fridge before but that never happened. Maybe it’s because Chileans don’t believe in keeping their refridgerators cold enough to actually, well refridgerate anything. Hey PQ, if you ever run out of things for your “Lick the Produce Section” thing – try going to Saranga International Grocery (Lafayette Rd. & 34th). I went to check it out today and there were some monstrous-looking veggies there that I had no clue what to do with. PQ – Thanks for the tip! I have done the same thing and it is nasty-almost makes me love them a little less knowing that they can turn into that!